Originally published on Woman Around Town. 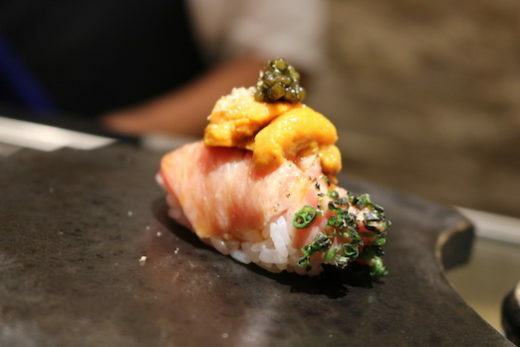 Calling all sushi lovers; have you tried omakase style yet? If not, what are you waiting for!? The fast-growing trend has swept through Manhattan and now it’s finding its way to Astoria, Queens at Gaijin, the brainchild of Executive Chef/Partner Mark and Owner Jay Zheng. The highlight of the restaurant is the intimate sushi bar, where the chef prepares fresh sushi directly in front of the guest—piece by piece and course by course, sometimes even from his hand to yours. 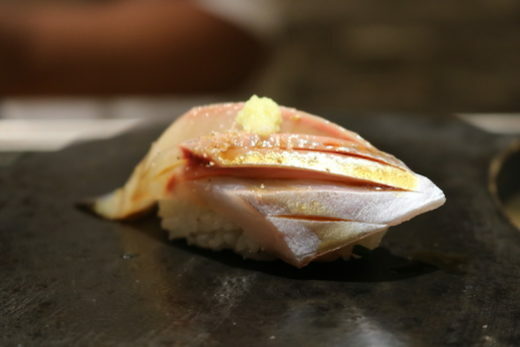 By preparing the sushi one piece at a time, the chef ensures that the rice and fish are the ideal temperature, negating the time it would have taken for the food to travel from the kitchen to your table. 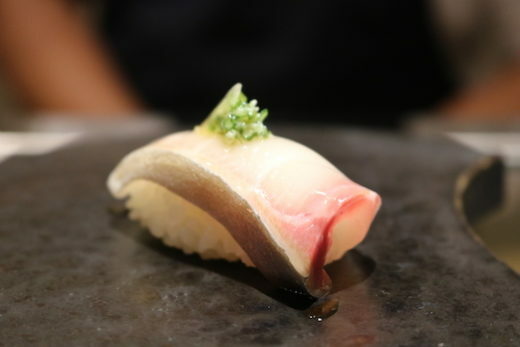 After trying omakase, I agree that it’s the optimal way to eat sushi and can be especially interesting if you want to learn a thing or two about sushi-making, considering the chef cuts the fish from the full filet and builds each piece in front of your eyes. 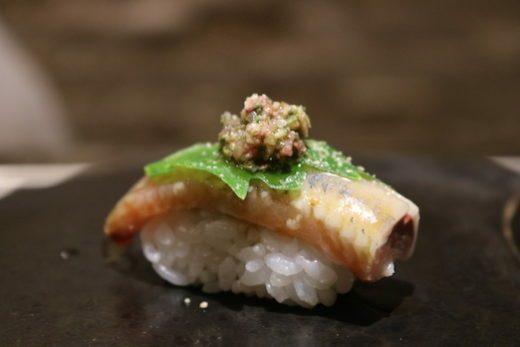 While there’s a plethora of Japanese restaurants featuring omakase dining these days, Gaijin truly shines and is the perfect restaurant for a special occasion or for foodies who want to have a unique meal any night of the week. 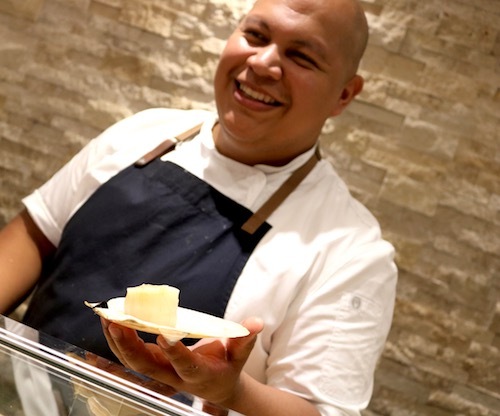 Chicago native Chef Mark has a passion for applying a contemporary twist to traditional sushi techniques—respecting the art of the craft while elevating the flavors with his own personal style in surprising ways (truffles, anyone?). 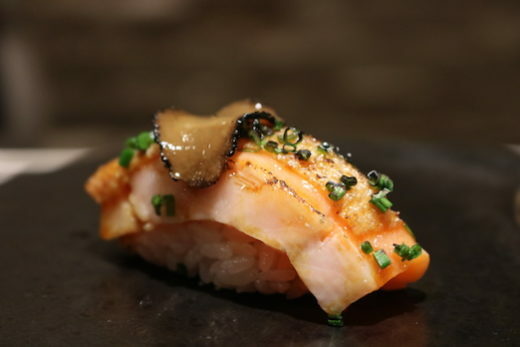 Gaijin exceed my expectations with 5-star service, high quality fish shipped daily from Tokyo, and innovative flavors all rolled up into a one-of-a-kind experience in a sleek modern environment. 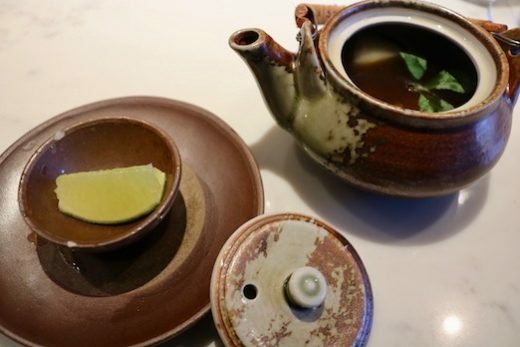 The 13-course tasting menu began with a hot brothy soup served in a ceramic tea kettle. The server instructed us to squeeze fresh lime into the soup, cover it, and allow it to seep for at least 30 seconds before pouring it into a small bowl. It was light and delicious, consisting of daikon radishes, shiitake mushrooms, and chicken for an overall earthy palate with a citric zest. The Pacific Coast Oyster (opening photo) was a standout dish—I couldn’t believe how gigantic the oyster was. It had a deep shell, and tasted very clean with a light sweetness, accompanied with a little spice from chiles and pazu sauce. 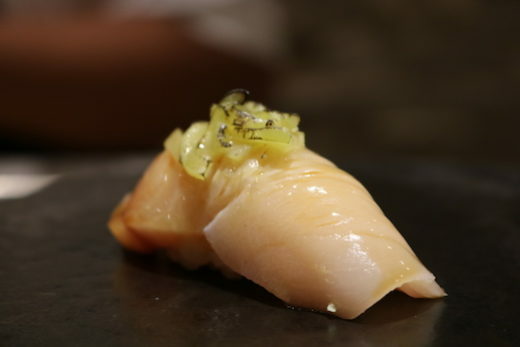 The attention and care that Chef Mark put into each piece of sushi was equally impressive and engaging because his passion for sushi-making and food at-large came across. The pieces that linger in my mind are the ones that felt both familiar to traditional sushi that I would normally order and simultaneously unique. Chef Mark lightly torched a couple of the sushi pieces, not enough to cook the fish but to warm the garnish or lightly sear the outer layer. 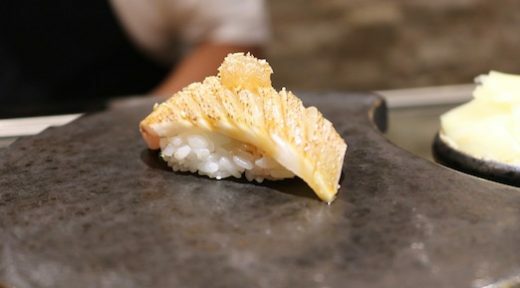 The Japanese Snapper was gorgeously golden and topped with daikon and sesame seeds, giving a mild crunch. Next he melted a little butter onto the Bora King Salmon before piling chives and truffles on top—this one was to die for. 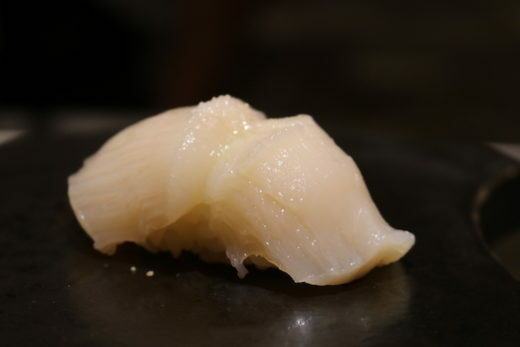 The most memorable piece of sushi was an enormous (5-inch shell) live scallop that Chef Mark opened and carved out of its shell before squeezing a spritz of fresh lime juice for extra zest. 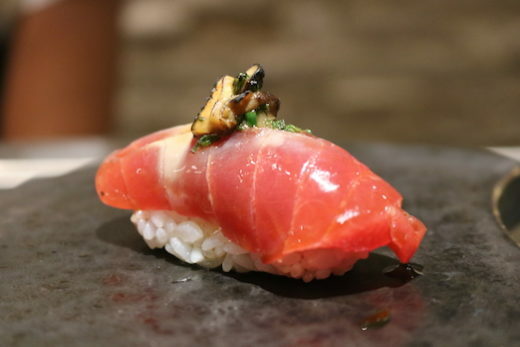 It took a little bravery because when I picked it up I could feel it pulsing in my hand—luckily it tasted incredible and sushi simply doesn’t get any fresher than that! The soul of Gaijin pumps with their creative ingredients. From crunchy and smoky almonds served on top of Akame Spanish tuna with soy and shiitake mushrooms; to the decadent Russian caviar that gave an explosion of flavor to the Chutoro (fatty part of tuna); and the kick of the sweet banana peppers atop Himachi yellowtail, each course was more unexpected than the last. At this restaurant, what I found was an innovative culinary experience and the chance to explore a new side of one of my personal favorite cuisines. An elegant sake is a great addition to complement sushi. Gaijin boasts an impressive list of dozens of sakes within a wide price range. 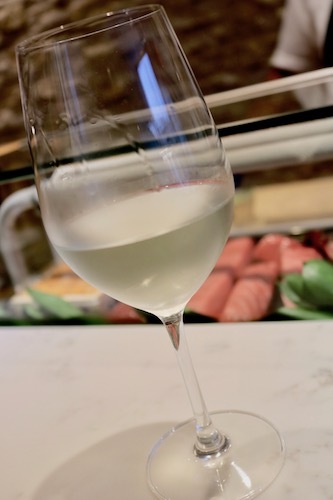 I first tried the Tamagawa, Heart of Oak from Kyoto, which was delicately light with a round mouthfeel and soft floral notes. But for the royal treatment, I would highly recommend the Kamotsuru, Tokusei Gold from Hiroshima; it’s the sake that the prime minister of Japan offered President Obama when they met. If a piece of gold leaf is poured into your glass, it’s said to be good luck, so don’t forget to buy a lotto ticket after dinner! Gaijin is located at 37-12, 31st Avenue, Astoria, NY, 11103. Phone: (929) 328-2890. Hours of operation: Mon-Thurs 5pm-10pm, Fri-Sat 5pm-11pm, closed Sunday.